Did you ever wish you could import all the painstakingly edited metrics you have made to a font file into another one? Or did you end up with two font styles that are part of a single font family but have different sizes? In any case, please first read our article on Size, Units & Scaling as well Font families. You should import spacing values only when the glyphs of both fonts have similar width. 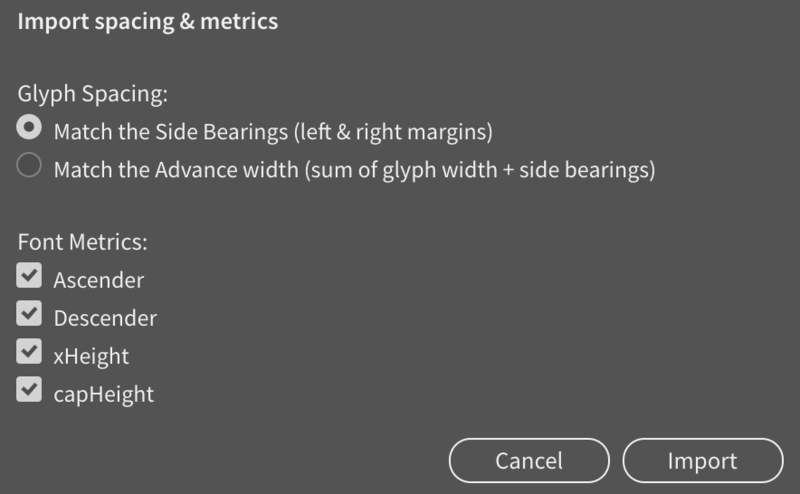 Also note that if your glyphs in both fonts have a vertical size difference above 10%, you will be prompted with a second alert to eventually upscale/downscale all the glyphs in your font, and to reset the Ascender & co so both fonts have the exact same metrics. You should import spacing values only when the glyphs of both fonts have similar shapes. If both fonts feature a different glyph height, you will also be prompted whether you want to adjust the size of your current glyphs to ensure that kerning pair values are relatively equal. Ok, ok, we know this is all but simple. We tried to cover the most common use cases, so if you have any doubt, first try experimenting by using the feature, installing new versions of the fonts (always good to have backups ;) and keep us posted if you can refine the wording of this article or in the app.